Annually held at the ExCel centre in London, the BETT show is probably the world’s leading showcase for the latest technology in education. 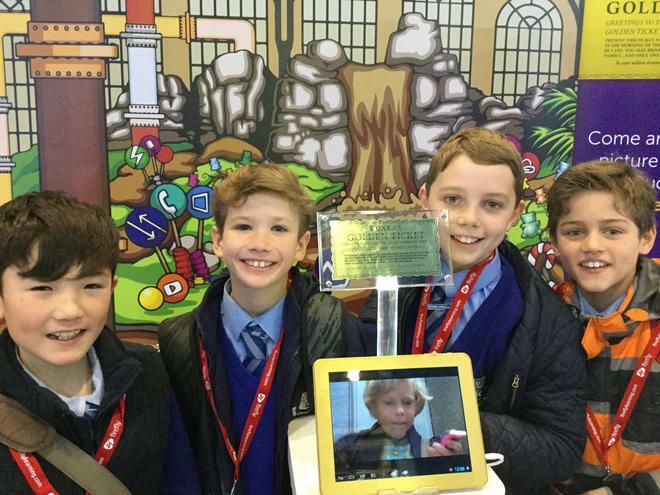 A group of four boys (Oscar Timms, Magnus Wolff, Jasper Patton and Jack Boxley) together with Mr Sutton, attended the show in January to programme a car for a race in Maths in Motion. During the morning they were able to observe the technology, testing many new unique applications, and gaining a large crowd on some of the stands. Their favourite was the new Minecraft for Education. Despite all the enjoyable engineering, they were beginning to think about programming the car, which they were going to race against 7 secondary and 7 primary schools in the afternoon. Arriving at the Toshiba stand they started work on their car and reported the event. “In order to complete the car safely in the 1 ½ hours given, we separately went away to measure the track, find features and log into the computer to commence workshop adjustment. (these are all the first stages to programming the car). We all felt increasingly confident in our abilities to program a successful car. With our calculations going well, we were ready to enter after one hour. Knowing we had a large amount of time left, we went back just in case we could produce a bit more speed. Although it is extremely rare, the nice man, Richard, on the stand rewarded us with a few more practice laps and with these we managed to move up a few places. This therefore meant that we were second position on the grid. Proud with our days’ work and our time up, we left the stand with keen smiles and hopes for a victorious win.